Wirefly has been on a rampage of late in regards to some eye opening pricing for some recently launched handsets. 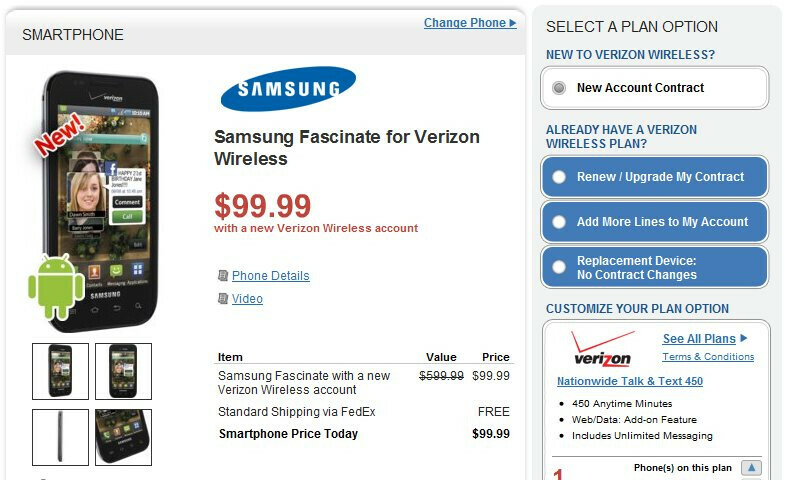 Its latest victim, Verizon's Samsung Fascinate, is getting its customary price chopped in half all the way down to $99.99 with your signature on a 2-year agreement. It easily looks much more appealing on paper versus Verizon's own direct pricing of $199.99, but even better, the special pricing is being made available to customers with an eligible upgrade. Throw in free shipping and the fact that it's the latest high-flying Android handset from the nation's number one wireless provider – it just makes for one compelling argument to look at it even more. Wirefly surely didn't waste any time in grabbing the attention of customer with this sweet deal – which we'd assume can sway certain people to side with it over others. wirefly is a scam!..read the fine print!...you still pay for everything else which makes up for the price!